Manhattan is locked into a bitter winter, and gripped by gruesome crimes. Someone is killing people through an online dating agency called EliteAirs, in the new crime novel on Kindle, Compulsion. Months after the Kauai episode, and still healing from his psychic and physical wounds, Karl Standt finds out about the case from his New York Post crime reporter friend, who uses a lurid Twitter feed to keep his followers up to date on felony and mayhem. Standt pursues the killer, with a segue into Vermont's Northeast Kingdom, along with his brave young crew of colleagues, including Church, a hacker, Katie, a Slate reporter, and iz, a goth poet with a taste for nightclub dancing and MMA moves. Standt also teams up with Vlad, a Russian emigre with a taste for Stoli Elit and a current job with the Detective Bureau. 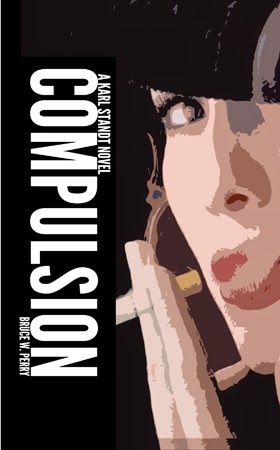 Compulsion is the third book in the Karl Standt series, after Barbarous Coasts and the equatorial noir novel, Gone On Kauai.